A new series of sculpted installation (made from rusty steel) has just been peppered along Ports de Paris which opened today. Such serendipitious coincidence that I went awandering near Parc André Citroën and came across a few of them. I haven’t time to check all of them out though. Accordingly they could be found along River Seine running from the park to the Eiffel Tower. 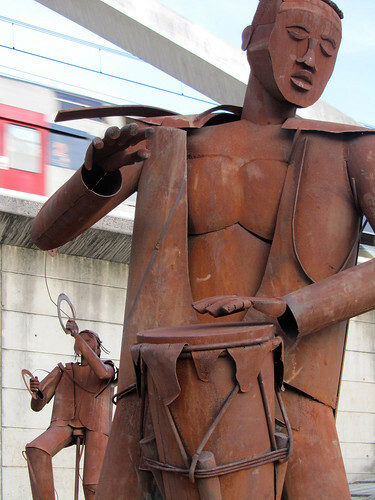 Created by Edgardo Carmona, the pieces by the quay-side gates of the park include the artistics (carnival musician, bike juggler, ribbon gymnast), the day-to-day (umbrella blown with the wind) and the amusing (man with beer – after a late night out maybe – and dog, both peeing to a lamp post). I wonder what else are installed upriver from here. since it’s a temporary exhibition. mind, they do look very sturdy.